I finally got my hands on a pinafore. It's a Topshop one that I found new from eBay, and of course as soon as I put it on, I spilt nail glue on it. Forever clumsy. It's not too noticeable, thank god, but if anyone has any idea on how to get nail glue out of clothes, PLEASE HELP! The denim has gone all hard and rank where I dropped it - gross, I know. I think the denim pinafore and monochrome striped top combo has been the most common outfit I've seen it the past month or so, and I'm leaping straight onto that bandwagon cos I love it. I've always loved the look of denim and stripes paired together, and now I can rock it like everyone else - in a cute pinafore. Can I also just say how amazing the skirt on the pinafore is - it's so a-line it hurts. I went for my Stan Smiths, because I like the casual feel they give to the whole outfit. I love your style so so much!!!!!! I have no idea how to get nail glue out, but my go to for anything is bicarb of soda mixed in with a little water! The pinafore looks so cute though! Sorry I couldn't be more helpful! I'll give that a go, hopefully I'll have some luck with it! Thanks! I love everything about this outfit! Pinafores and stripes are always a good combo! Also, you're making me want to wear my fringed leather jacket now, yours looks so good.. This is so cute. I love my pinafores, they're so easy to throw on. That jacket is just amazing, I don't have anything like this outfit in my wardrobe! Love this outfit, especially the denim pinafore! Lol I literally just purchased the same kind of outfit last week - a striped long sleeved top and a denim dungaree (the second one I own at the moment). I always procrastinate when I find more interesting pieces, but I think nothing beats a simple, comfortable and 90's inspired look. You look amazing - I love the denim pinafore paired with the striped top! Thank you! It's so annoying, I'm pretty sure there is no way to get it out haha! I think this is such a cute look, especially with tights! Your hair makes me want to get bangs - though my hair is nowhere near as voluminous and it would look terrible haha! Thank you! Trust me, mines not either, but I use a volumising shampoo and conditioner, and Batiste the get the volume aha! Such a great look and love your styling of it! This is such a fun look, I love it! Great post, love this outfit. I love your whole look~ it fun and cool. 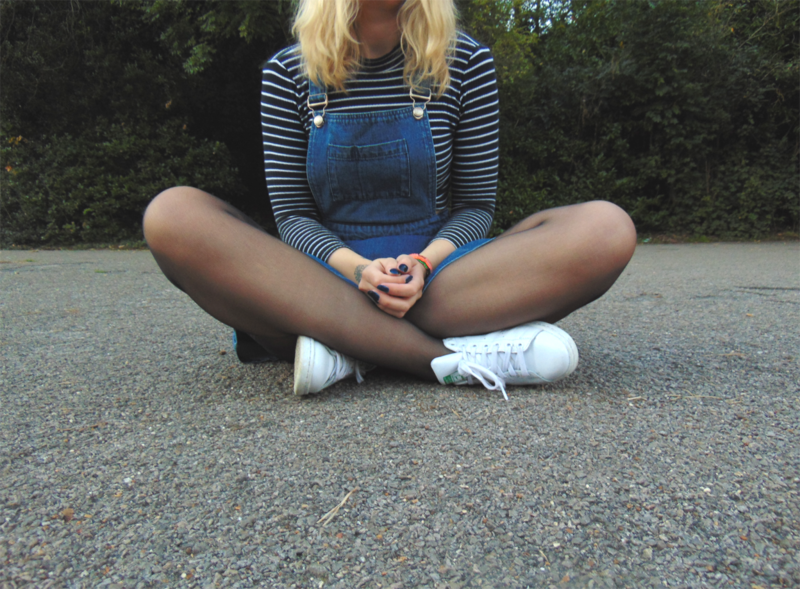 I do agree that stripes and pinafore goes well together... Lovely blog you've got btw! I love this outfit so much, its cute, its comfortable and something i would wear to go out with friends. Pinafores are so cute and easy to style to create many different outfits. I really love your fashion. Love this look. For some reason the photos reminded me of an old Arcade Fire music video? ahha I love them! Such a cute look and I love the addition of a tassel jacket, it amazing!! I can definitely see myself wearing this outfit! So laidback! Oh I love the pinafore! Specially combined with the Adidas, perfect casual vibe. Great look! My favourite piece is the jacket... so cool! Looks really cute, yet comfortable. I really want one now!!! Pinafores and stripes are what I'm all about! Love! Love this outfit! The pinafore is really nice!